Eat Here: A Food Lover’s Guide to Shreveport-Bossier was designed to help visitors and locals discover Northwest Louisiana’s culinary offerings. 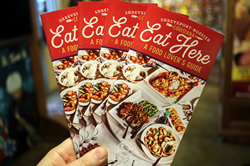 The fourth edition of Eat Here: A Food Lover's Guide to Shreveport-Bossier is available now from the Shreveport-Bossier Convention and Tourist Bureau. Dishes featured in the guide range from Louisiana favorites like stuffed shrimp and icebox pie to global flavors from China, Hawaii, Peru, and beyond. The Shreveport-Bossier Convention and Tourist Bureau has released the fourth edition of Eat Here: A Food Lover’s Guide to Shreveport-Bossier. The pocket-sized, 30-page guide may be downloaded or viewed at http://www.Shreveport-Bossier.org/EatHere. Printed copies may be picked up for free at 629 Spring Street in downtown Shreveport or requested by mail by calling (800) 551-8682. The cover of this edition features Lucky Palace Chinese Restaurant in Bossier City, a local eatery that has twice been named a semifinalist for the coveted James Beard Foundation Award for Best Wine Program. Contents of the fourth edition include a guide to international eateries in Shreveport-Bossier as well as festival fare, iconic and historic menu items, and favorite dishes of local foodies. The brochure also includes the fourth installment of “20 Celebrated Bites,” a list of popular menu items from local restaurants in Shreveport-Bossier. Without repeating “celebrated bites,” the guide has now listed 80 popular dishes found on local menus since the first edition was published in 2015. To read reviews of local restaurants in Shreveport-Bossier, visit the official destination blog at http://www.20x49.com. For more information on planning a trip to Shreveport-Bossier, including information on accommodations, attractions and more, visit http://www.Shreveport-Bossier.org or call (800) 551-8682.